Shrek was just your ordinary Merino sheep living in South Island, New Zealand. That is until the year 2004 when he sky-rocketed to fame over his GINORMOUS wool coat. Usually Merino sheep have their coats sheared once a year, but Shrek the sheep hated nothing more than having his coat removed. And so he devised a plan to avoid shearing forever, he was going to escape and run away. Some breeds of sheep naturally shed their wool each year, but Merino sheep, typically raised for meat, never shed their fleece. Hidden behind cave walls, far from any shearing blades, Shrek’s wool continued to grow, and grow, and grow some more. In fact, after 6 years without any haircuts, Shrek had enough wool to produce 20 suits for men, large men. 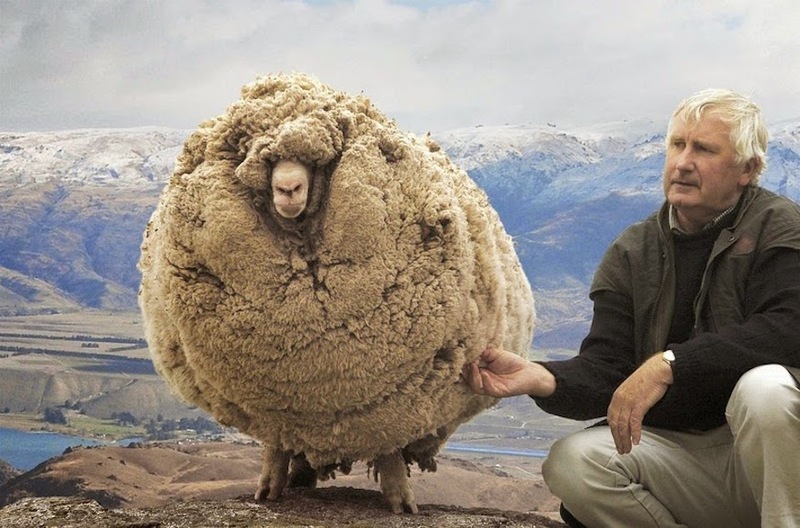 Each year Shrek continued to grow the normal amount of hair for a Merino sheep, but since it was never shed or cut off, he was found with 6 times the average amount of Merino fleece. His fleece in total weighed around 60 pounds! This caused many to ask if sheep fleece would continually grow forever without being sheared. Dave Thomas, the head of sheep studies at the University of Wisconsin, Madison, says that the Merino sheep will forever continue to grow incredible amounts of wool without being sheared. Almost all year long this type of sheep continues to pack on the fleece. So is it ever dangerous to have so much fleece? Dave Thomas admits that all of this wool canbecome a health and safety concern for sheep. Especially if they are in very hot conditions, in which case heat stress can become a real issue. Also, if a sheep’s wool becomes too large they can get stuck on their backs, unable to get up. Shrek is not the only sheep to hate the shearing process, although it’s a quick and pain-free ordeal that sheep get more and more comfortable with as they age. Baby sheep tend to have the most disdain for shearing, causing a lot of commotion the first few times they experience the process. Once they learn it is not painful and doesn’t negatively impact their life, they tend to become docile about it. When done by an experienced individual, shearing only takes around 5-10 minutes max. Shrek hardly looked anything like a sheep with so much fleece–in fact, his eyes appeared to be completely covered. People couldn’t get enough of the cute little rebel, and so when he finally was sheared, it was broadcasted on New Zealand’s national television for all to witness. Shrek was also famous enough to meet the Prime Minister of New Zealand at the time, Helen Clark. All of Shrek’s fleece was auctioned off to support medical charities for children. Shrek has since been depicted in children’s books and made his fair share of charity appearances. Under a watchful eye of course, after all, Shrek is a run-away rebel sheep at heart. 2 years after Shrek was first sheared on national television, he was sheared for live TV again, this time floating on an iceberg, just off the coast of Dunedin, New Zealand. Sadly, the adorable and rebellious sheep passed away in 2011, he was 16 years old. RIP Shrek, you will be loved and adored forever!